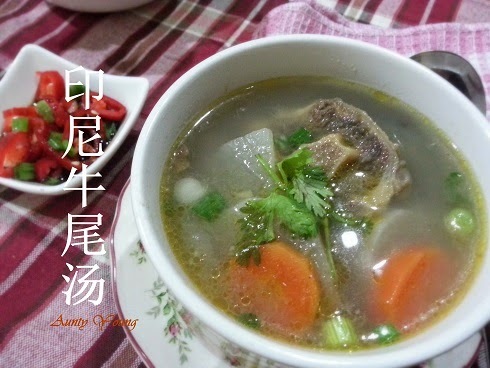 One of the reasons I decided to make this soup was because I saw this soup at Phong Hong's blog. Her funny story there had me laughing hard. This is actually a really delicious soup. The spices add flavor to the soup, while the onions, carrots and radishes also make a good combination with the soup. The smell that wafted out of the kitchen as the soup was broiling......mmm! 1. Boil oxtail and water in a pot. Reduce heat and simmer for 30 minutes or until oxtails are cooked and tender. 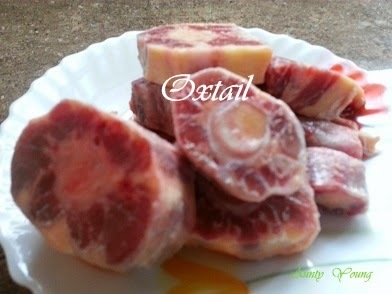 Remove oxtail from the stock and set aside. Strain the stock to get clear broth. Return the broth and oxtails back to the pot. 2. 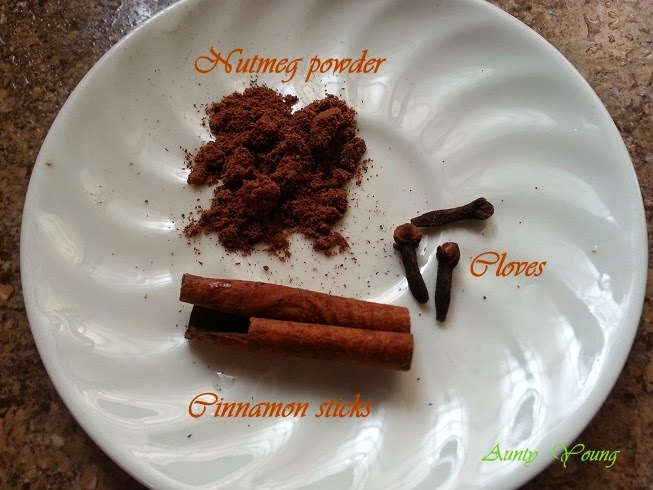 In a frying pan, heat oil and saute spice paste, cinnamon stick, cloves and nutmeg until fragrant, about 5 minutes. Add this to the pot of oxtails. 3. Bring the oxtail and broth back to a boil. Add carrot and potatoes and season with salt, sugar and ground white pepper. Reduce heat and cook until carrot and potatoes are cooked and tender, but still quite firm, about 20 minutes. Adjust salt and sugar as needed. 4. Turn off the heat. Serve the soup with slices of tomatoes, scallion, and Chinese celery. Sprinkle the soup with some deep fried shallots. 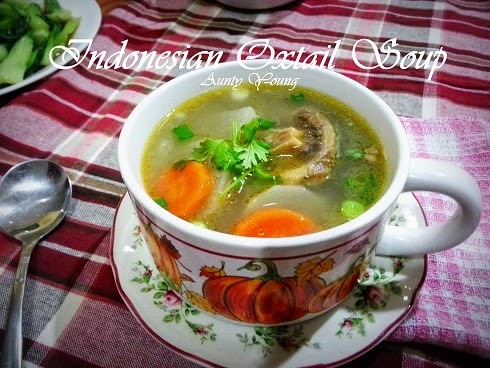 The soup is best eaten still piping hot with a bowl of steamed white rice accompanied with the chili sauce and a squeeze of lime juice. 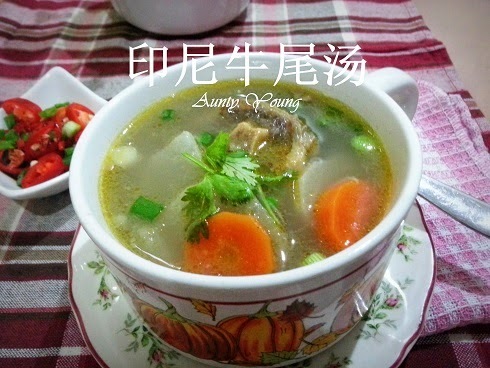 My hubby loves this soup very much. Thank you Phong Hong for this selfless sharing! It might be somewhat different from the Oxtail Soup served at Western restaurants, but it is still definitely a keeper recipe. Aunty Young, thank you for trying this recipe hee..hee..!!! And thanks for the mention. 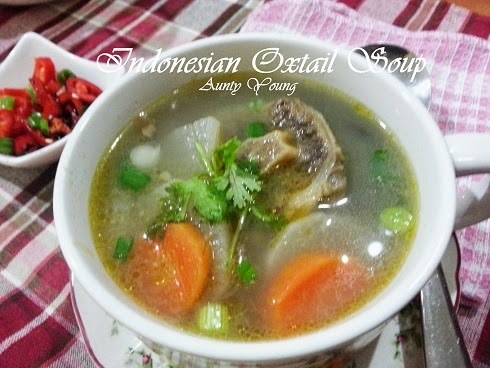 Your oxtail soup looks fabulous and I am glad that you and your hubby loved the soup! Thank you for your hilarious story again, you know? Actually I also have built-in air bags like you too,he....he..... give me 5! I love this I love this I love this! It looks so yummy, hearty and comforting. Yum yum two big bowls for me please. Glad to know that you love this soup. Thank you .